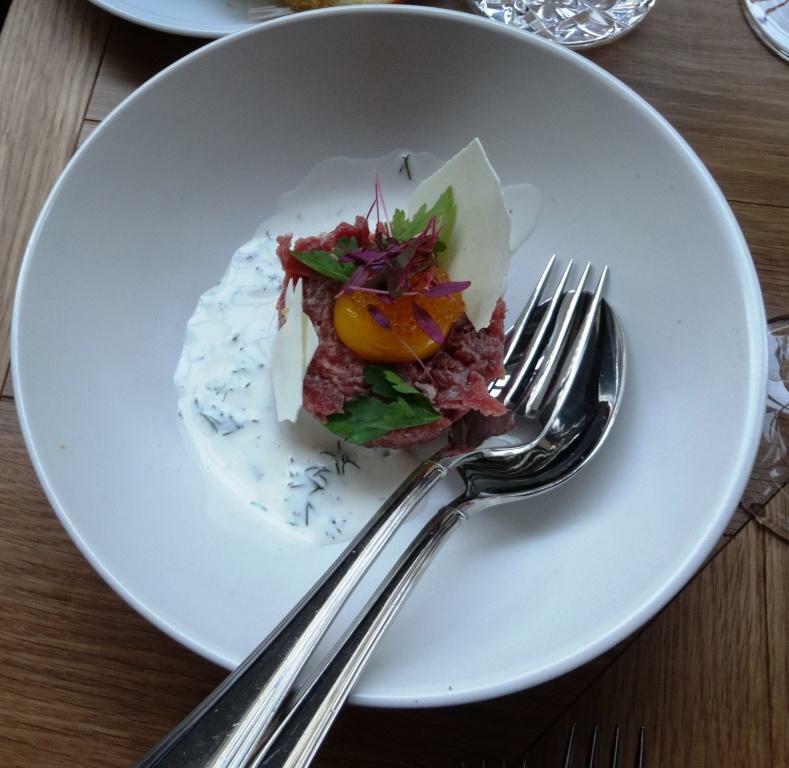 Bronda, the 4th restaurant in Helsinki by Tomi Björck and Matti Wikberg, opened it’s doors on Monday 10th, 2014. 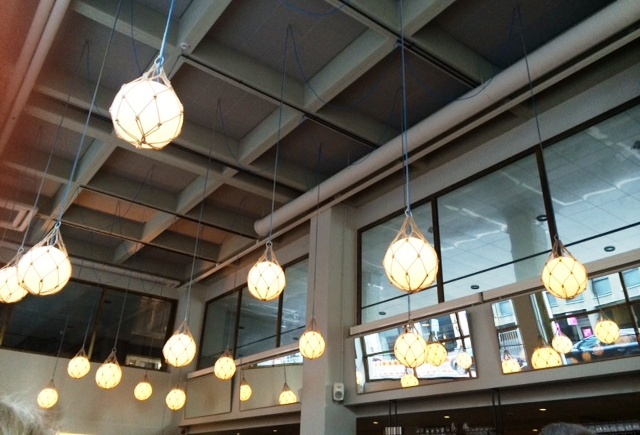 Located on the corner of Eteläesplanadi and Korkeavuorenkatu, large space with high ceilings and big windows with otherwise plain interior design, offer interesting dining experience. Nautical roof lamps and mirrors on the wall are eye catchers. The lounge bar is open until late and it offers view to Park Esplanade. It surely will be one of the most busiest bar in the district. Bronda name comes from the building restaurant is located. 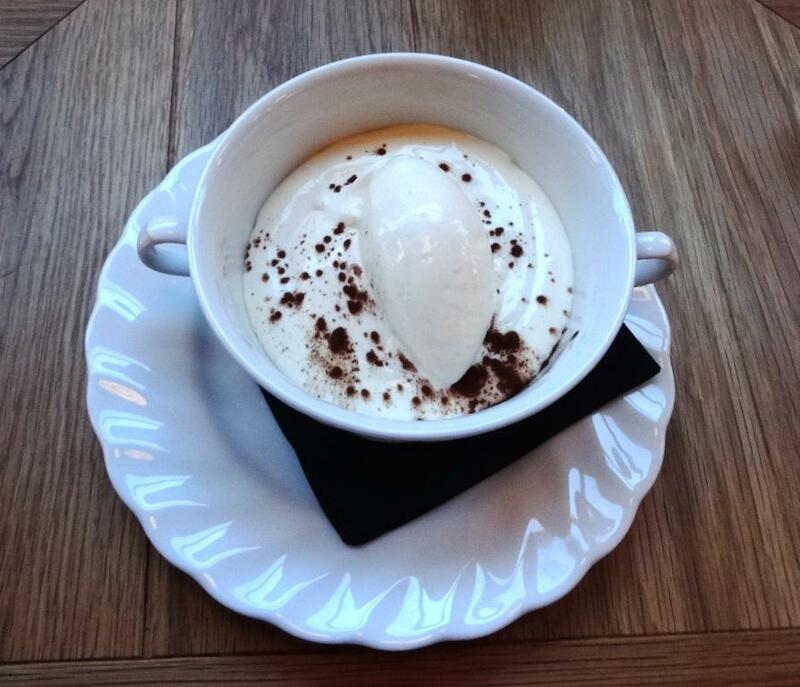 Bronda’s dishes should reflect Europe and particularly countries Spain, Italy and France. The food is meant to be shared as in other BW restaurants Farang*, Gaijin* and Boulevard Social (*reviews available on reijosfood.com). 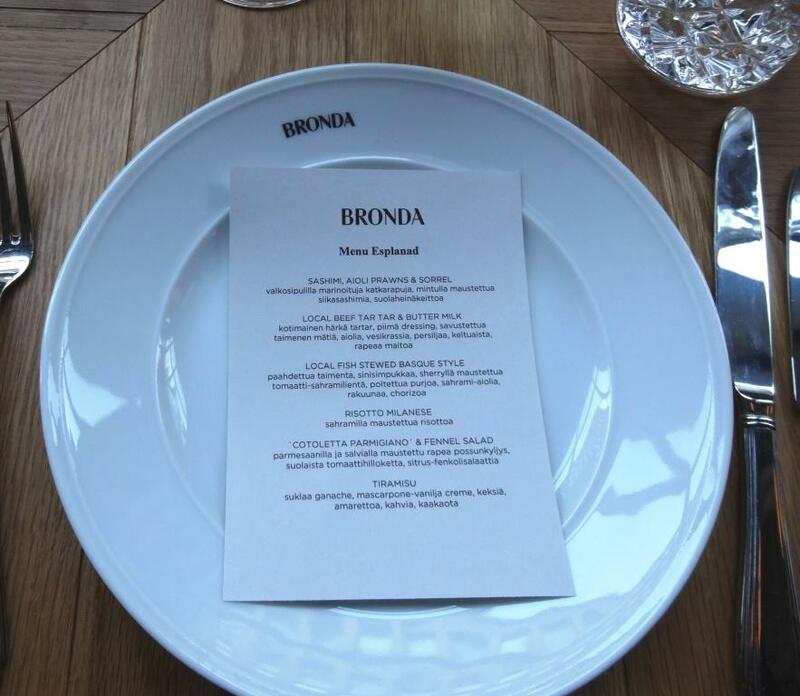 Bronda concept is copied from those succesful Bib Gourmand restaurants; even same drinks with same exotic names are served. First look at the menu was challenging; you could choose from snacks, fresh and/or warm dishes. So we decided to choose one of the two tasting menus, Menu Esplanad, with suggested wines. 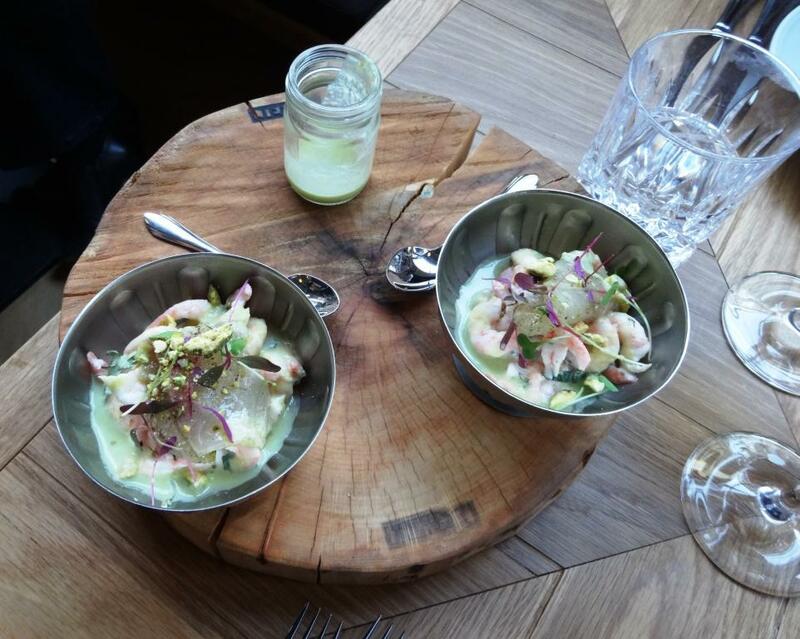 Dinner started with Sashimi, aioli prawns and sorrel which were served on a wooden plate. Sashimi was prepared from lavaret (whitefish). Fish was soft and mellow and shrimps were fresh of course. In overall excellent combination after sorrel soup was poured into the bowls. 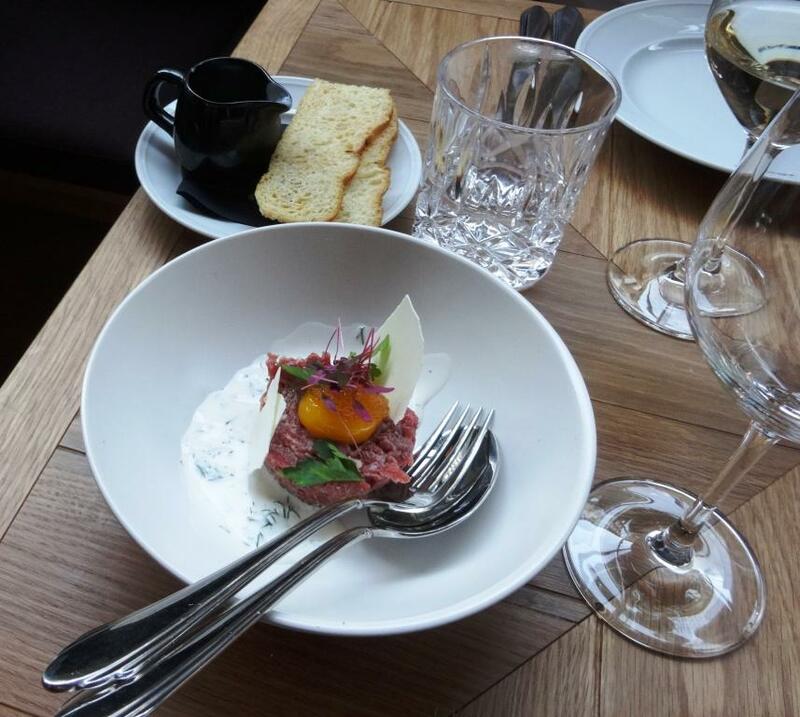 Second dish was Beef tartar with butter milk and dried bread. If your read menu, you can see that there are lot’s of different ingredients used. I am not sure, if we could find all of them, but beef was tender anyway. This was also the first dish to be shared, so portion had to be divided in two parts. 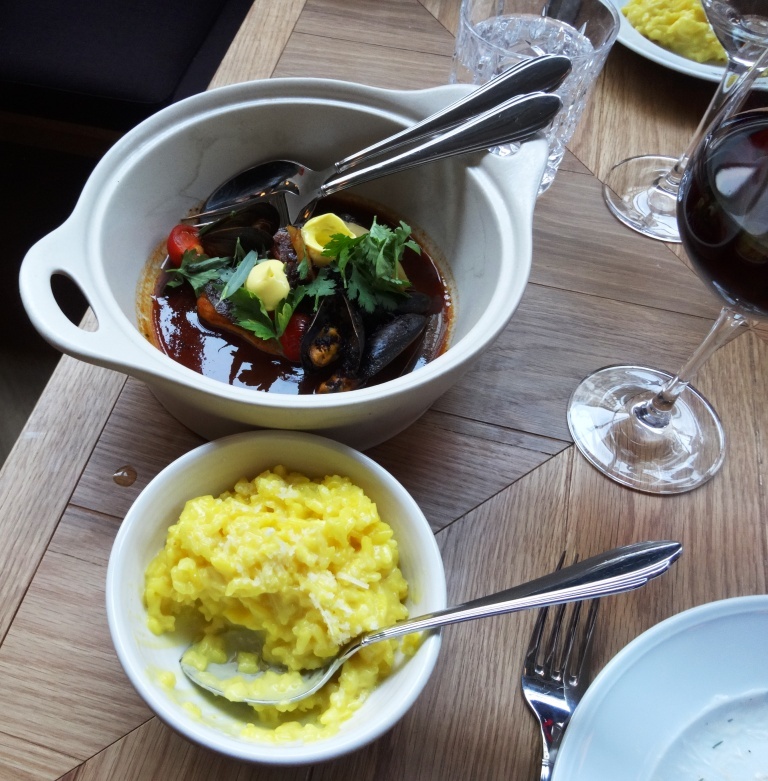 Then we were served third and fourth dish at the same time; Fish stewed Basque style and Risotto Milanese. 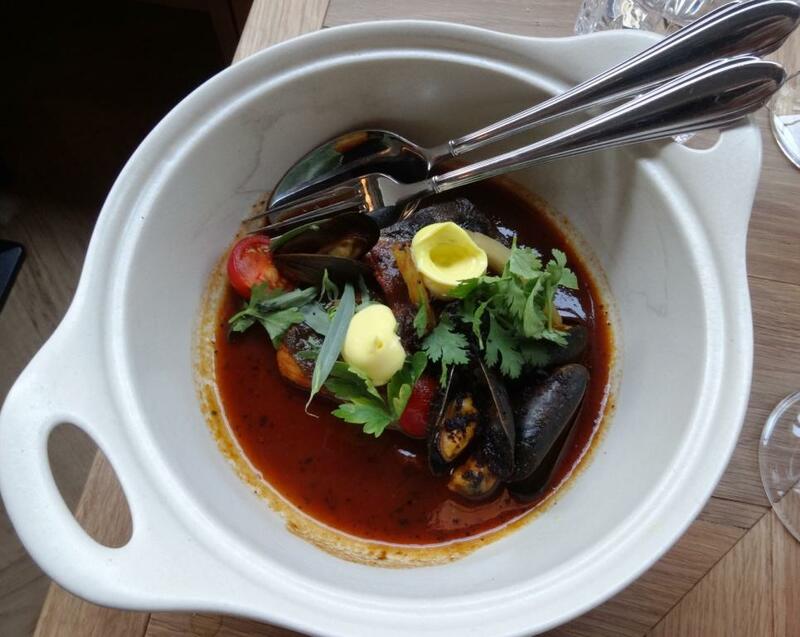 Basque style meant mussels, chorizo and sherry flavored stock. Tempting, but at the same time challenging dish for the kitchen. Fish itself was ok, but one of the 5 mussels had not opened. No chorizo taste at all, actually one small bite was found. Risotto had waited serving some time as it was not so warm anymore. To prepare perfect structure, kitchen needs some more practice. Last so called main course was dissappointing. On the menu it says Cotoletta which means schnitzel. However, more detailed description tells that you should get crisp pork chop. 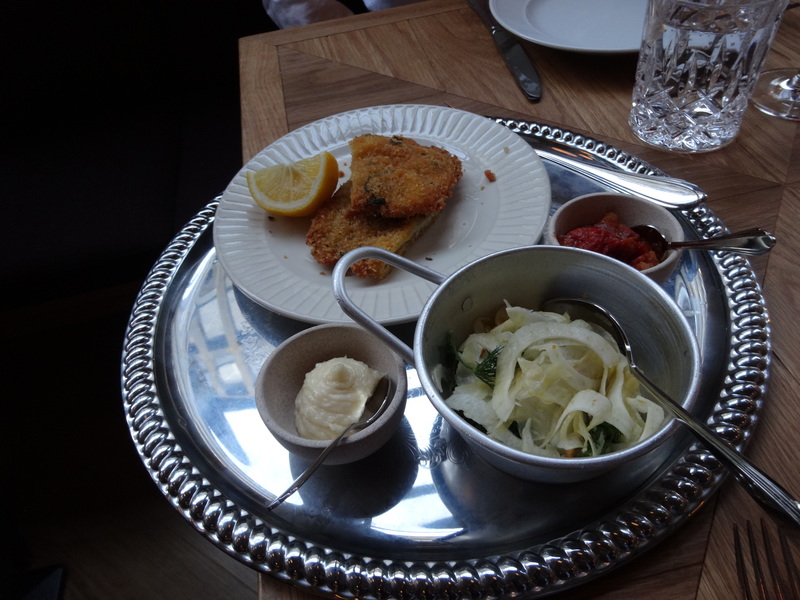 Bronda served dry Wiener Schnitzel with fennel salad and tomato compote. This dish dropped food grade below 4. I am sure this dish will not be as such on the menu in the future, but side dishes could be the same. Dessert should have been Tiramisu, but as we had asked one menu lactose-free, one portion was replaced with Lemon pie Bronda without informing beforehand. However, both desserts were delicious and crowned the dinner. 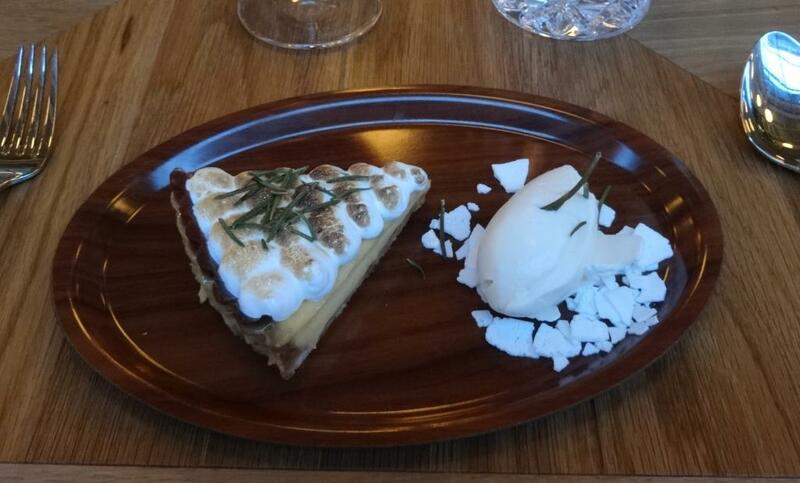 Pie included rosemary and thyme which made the experience exciting. When it comes to recommended wines they are overpriced. You pay 50€ for 2 1/2 glasses of basic wines. Choose instead a bottle or glass from the list, because some wines are quite reasonably priced. For the tasting menu first wine should have been riesling but it was replaced by gruner-veltliner. Second glass, pinot noir, was poured from 1,5 litre bottle. Third, dessert wine, was 5 years old Madeira which paired well with desserts. Bronda was full when we entered and was still full when we leaved. Relaxed athmosphere and loud background noise make restaurant perfect place for group gatherings. As snacks and some food are served in the bar, it will be the the most succesful part of concept. You can see Park Esplanade from the windows while dining and at the same time can observe other people present in the bar. Although portions are well designed and look impressive, propably food is not the main issue. Main idea is social interaction. Well, as I make my travels through Europe your blog will def be a go to! I enjoy your reviewS 🙂 also, you take great restaurant shots! Impressive lighting for indoors! Thanks for comments! It was still quite bright when we dined, which helped in taking pictures.